Positive: Compact size; high mobility; decent hardware; good price. Positive: Attractive design; good hardware; affordable price; decent processor; nice display. Are you in search of a new convertible? You don't want to spend too much? You are at the right place. Lenovo did a good job with the Yoga 530 series. Providing both performance and mobility at the same time. On the other hand, to my non-tech savvy friends, there are different variants to this model and my comments are only for the model 81EK00FYSP. Because other SKUs so to say have different configurations and therefore may not be as good as this one. Of course there are better configs compared to this model as well, so when you are interested in this series, don't forget to check the config carefully. Alright, going back to the topic. The reason why I say Lenovo did a good job, is that this laptop delivers. In my opinion besides providing a good price/performance ratio, it also delivers what it is supposed to. Meaning, the problem with most convertibles is that either they are too heavy, which makes them fairly useless, or they lack the performance to begin with. Intel 8th generation 8250U processor with 8 GB of RAM and 256 GB SSD is a good combo. When you combine this with only 1.6 kg of weight for a 14-inch laptop, it becomes really good. Now of course 1.6 kg is not a great number for something that you can use in tablet mode. But it is possible to enjoy the experience for some time. The only concern here is the screen. Since it is bright and touch enabled, it can cause some usability issues either under direct sunlight or places with lots of light. The other disadvantage is the connectivity options. Since you get 1 USB 3 C and 2 USB 3 A ports, you are pretty limited and need to carry on a dongle to be connected to a screen, which is not very practical. On the other hand, being future proof means to have at least one USB 3.1 C connection, which is not present. Other than that, it is quite okay to have this laptop. Current pricing at the time of writing is not that high, so if you are in look for a good convertible that is usable in lots of ways, you got yourself an option. Other alternatives would be HP Pavilion x360 or Acer Spin series. When considering a laptop purchase, it all comes down to what you want and how much you want to pay for it. If you can live with the idea of not being future proof connectivity-wise and are okay to carry an adaptor for external connections, I think it should be a no-brainer. But if those concerns you, better to check the alternatives and see what they offer. Convertibles and 2-in-1 hybrid laptops seem to be gaining good tractions in the portable computer market these days. Taking advantage of the fame of their Yoga line with the hybrid laptops community, Lenovo has launched another new hybrid laptop for their Yoga line, the Lenovo Yoga 530-14IKBR-81EK00FYSP. As per the norm with other laptops in the Yoga line, this new laptop also offers the same flexibility in the ways you can use it - laptop mode, tablet mode, and presentation/display mode. Lenovo’s new 530-14IKBR-81EK00FYSP is equipped with an Intel Core i5-8250U of the Intel Kaby Lake range. The CPU has four processors that, thanks for Intel’s Turbo Boost technology, can clock at a frequency of 1.6 GHz to 3.4 GHz, and it has four cores and 8 logical threads (with the HyperThreading technology). It may not sound like much when compared with other laptops out there, but this ultra-portable laptop will still let the user to do mid to heavy processing tasks like casual video and image editing. The casual gamers may be disappointed to hear that the new Yoga convertible laptop doesn’t come with a separate graphics card. The Lenovo Yoga 530-14IKBR-81EK00FYSP comes with the Intel UHD Graphics 620, an integrated card that comes built-in with the processor. However, casual gamers can try running low-intensive games like those casual indie games. AAA games and more demanding indie games will have trouble running, even at low settings. As for the display, the Lenovo Yoga 530-14IKBR-81EK00FYSP comes with an IPS FullHD touchscreen that supports multi-touch capabilities. The display is bright, brilliant and sensitive to touch, especially when used as a tablet. 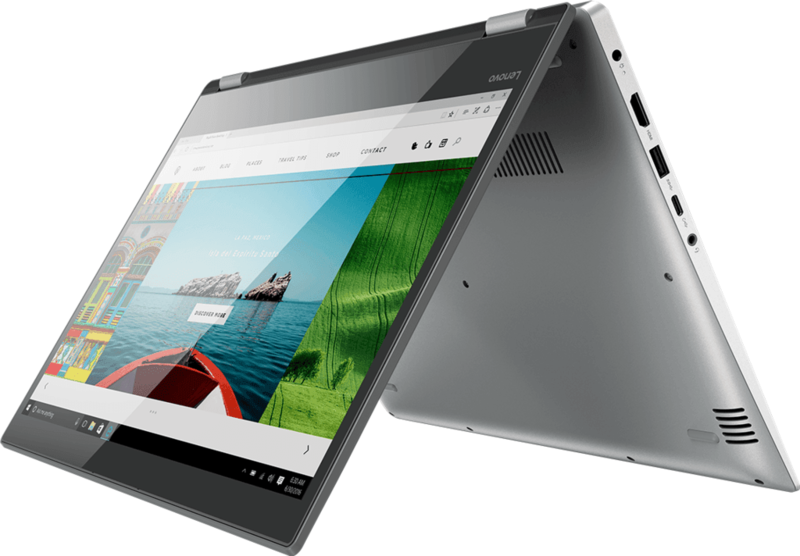 To ensure that the user experiences a smooth and fluid system, Lenovo also equips the Lenovo Yoga 530-14IKBR-81EK00FYSP with 8 GB of RAM and a 256 GB SSD. This is a big plus point over the traditional hard disk drive that a lot of manufacturers still favor due to the lower cost of hardware. Users who want to expand their storage size may also opt to add a large SD memory card to it. 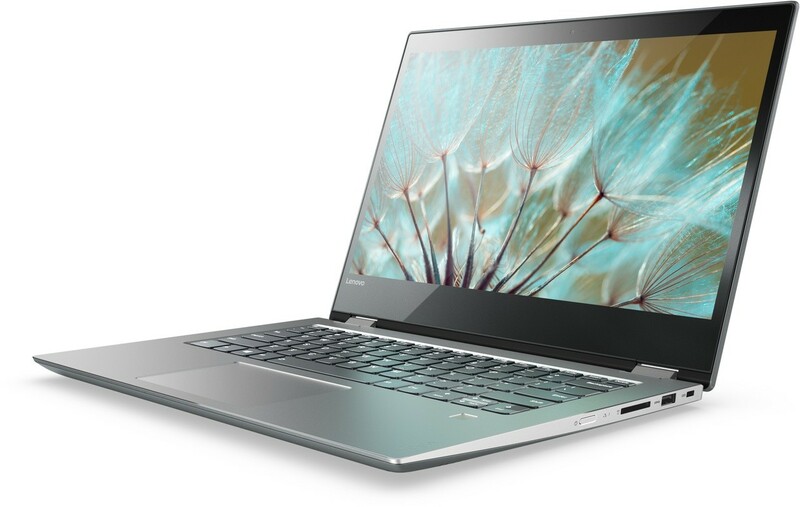 Connectivity and port-wise, the Lenovo Yoga 530-14IKBR-81EK00FYSP comes with one USB Type-C port, two USB 3.0 ports, a dual-band WiFi and Bluetooth 4.1 combo, an HDMI output port, one audio/mic combo jack, and a four-in-one card reader. 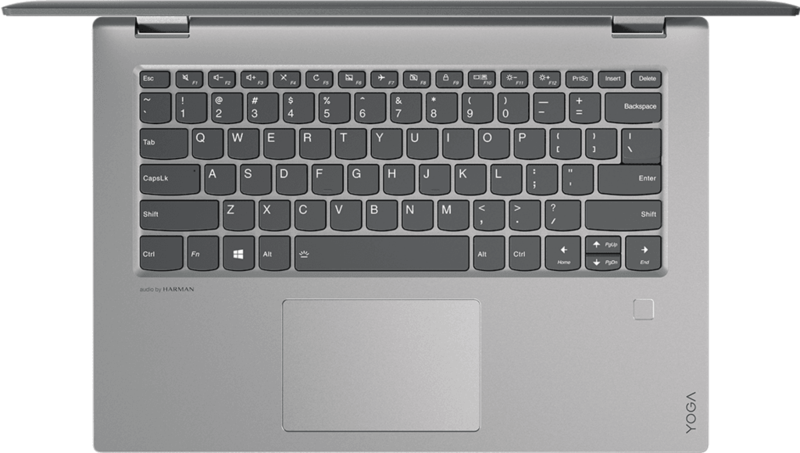 It also comes with an excellent fingerprint sensor, a great option to add more security to your laptop. They could have offered more ports. However, since this laptop is meant to be thin and lightweight, their port offering is actually quite sufficient. Measuring at 17.6 x 328 x 229 mm and weighing at about 1.6 kg, the Lenovo Yoga 530-14IKBR-81EK00FYSP is unfortunately not the thinnest and lightest convertible laptop that we have ever seen. However, for this price point, it does do what it sets out to do - offer more flexibility for those who don’t require bells and whistles with their laptop.